Read The Jersey Pocket’s first Giro Rest Day Roundup here. Having flown 2,500km down to the Mediterranean, the gruppo might have been forgiven for thinking that they had left the poor weather behind in Ireland, along with a great deal of good feeling and a fair few hangovers. In fact they were in for a set of rude, and often painful, shocks when the Rain Gods decided that they were having such a fine time following this years Giro d’Italia that they decided to tag along with the transfer and cause chaos for a few more days. Rain in Ireland is one thing it seems. It’s practically obligatory. But rain in Bari, in Viggiano and in Monte Cassino is a completely different story. Stage 4. The transfer itself had one significant casualty when Marcel Kittel – plunderer of Stages 2 and 3 failed to make the start. A fever caught during the transfer was blamed and, whilst the German was always expected to pull out of the race early, this seemed entirely plausible given the chance of a third win in a row. Kittel left it until the Tuesday morning to withdraw, meaning there was no time to reprint the points leader’s red jersey with the right sponsor which denied Sky’s Ben Swift a chance to wear it for one day. Given what transpired during the day though, this was the smallest of sideshows in the much larger circus that the stage quickly became. 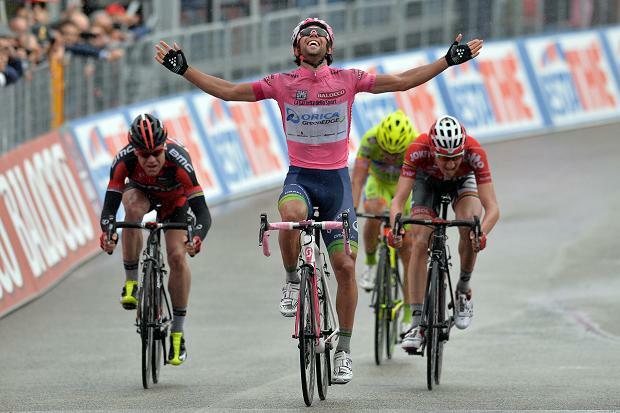 For the rain fell in Puglia and peloton controversially elected to neutralise the racing for almost the entire day. The problem wasn’t the actual rain itself: it was pretty light stuff that even the shabbiest of rain jackets could deal with. The problem was what the rain was falling onto. Roads that hadn’t seen rain for many months, and which don’t expect a lot of it anyway build up motor oil on their surfaces which isn’t easily washed away. The apparent ease of conditions led to a lot of disgruntled fans berating the riders for their go-slow, especially when, having pootled eight times around the finishing circuit in Bari in seemingly drying conditions, the riders chose to go full gas for the last lap when the rain had restarted. The expected chaos ensued with three major crashes on that single final corner-heavy lap. The build-up to the resumption to racing was increasingly bitter as the initial solidarity of the peloton slowly disintegrated when some teams felt it was OK to race and others – notably OGE and BMC – felt that it was not. The slide-outs that marred the final lap (after the commissaire’s had decreed that the GC times would be taken from the penultimate lap) justified the earlier decision to a degree but a similar amount of ill-feeling remained in the peloton that would now remain throughout the week. Pink jersey leader Michael Matthews had bowed out of the ill-fated sprint safe in the knowledge that his lead was safe for another day at least. Nacer Bouhanni looked to be out of it too having suffered a puncture just at the pace whipped up. In Kittel’s absence Giant-Shimano had transferred their eggs to Luka Mezgec’s basket but gearing problems on the last corner left his final man Tom Veelers alone to continue his lead-out sprint all the way to the line. Bouhanni, paced back on by his entire team, came from as far back as Kittel had done on Stage 3 but the slowing Veelers was no contest and the Frenchman took an emphatic win. Traversing the length of Italy in a few short days was never going to be all flat and Stage 5 was a day for the rouleurs with a lumpy parcours and an uphill finish. Matthews had targeted this day from early on and he was in the reduced peloton which arrived at the foot of the final climb. Joaquin Rodriguez was looking active but it was Tinkoff leader Nicholas Roche who attacked first. He was reeled in quickly by Cadel Evans who looked good for the win but Lampre’s Diego Ullissi passed him on the last corner to take the first Italian win of this year’s Giro. 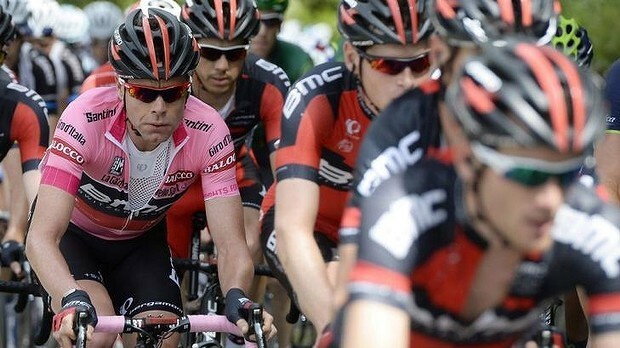 Matthews was in the same group to retain pink whilst Uran also crossed early to improve his position to fourth. The familiar term The Longest Day is more traditionally associated with the beaches of Normandy but it was equally applicable to another famous WWII battle site on stage 6. The run up from Sassono to the stronghold at Monte Cassino was already slated to be the longest mileage day even before a landslide forced a re-route adding a further 10km to the tally. But once again it was the weather which took the greatest toll. The rain was more severe than the day before but the racing remained on throughout and eventually the peloton caught a 4 man break who had stayed out for over 200km. The pace was whipped up on the approach to the final climb to the famous Redoute and the rebuilt monastery at the top but sadly a significant number never made it up. Two huge crashes at a roundabout near the base of the climb defined not only the day but also possibly the Giro itself. The first crash looked fairly routine; an Astana, Katusha and two Europcars falling nastily at the left hand side of the road. Whilst the camera lingered on the stricken though, much worse was happening ahead. By the time the TV pictures moved on to the second crash some 100 metres ahead, the extent of the drama was self evident. Bikes and bodies clogged the whole width of the autostrada and, as a small group of just eight riders were able to continue unaffected, it was soon obvious that this was a very big, very bad one. Team Katusha were the most obviously affected team with a number of riders on the ground and one, Giampaolo Caruso, who was motionless for a sickening few minutes before the race doctors belatedly got to him. His team leader Rodriguez, who had looked so spritely the day before, got back on his bike and laboured up the 10km climb like Jesus on his way to Calvary. Tinkoff-Saxo also fared badly with big hope Nichloas Roche eventually losing 15 minutes whilst other battle-scarred riders were still coming in 25 minutes after Matthews who, in that super select group with Uran, Wellens, Santoromito, Evans and a couple of BMC minders, had nipped in front of his countryman for the stage win. Again the fans questioned the decision making; whereas before they felt that racing should have been restarted earlier, now they were calling for the escapee’s to honour a ‘someone crashes so everyone stops racing’ rule. I’m with the folks who said those few guys were in the right positions exactly because this sort of thing happens further back. It’s called racing smart. 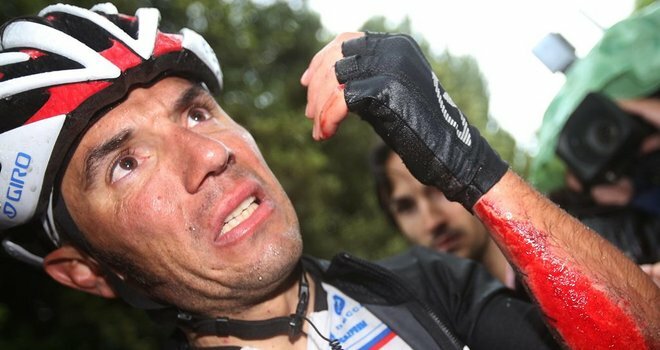 Behind, the casualties stumbled in one by in; local boy Stefano Pirazzi being physically pushed up the climb by a less damaged teammate; Svein Tuft, Maglia Rosa on Stage 2, pouring blood from acres of road rash. Ben Swift was the last man to cross. It was suitably attritional for this most famous of locations. After such high drama and tragedy it was always going to be a quieter, more sombre stage that followed. Bouhanni took his second win with a seemingly impossible dash up close to the barriers. Two more riders did not take the start, joining the five who were classed as DNF the day before. Rodriguez retired with broken ribs and fingers along with teammates Caruso and Angel Vicioso who had the worst injury with a complex triple fracture that could yet end his career. Bouhanni brushed all this carnage aside and won with yet another no-holds barred charge that defies logic, reason and sanity. All of which makes him a fantastic sprinter. Matthews held onto his jersey for one more day extending Orica Greenedge’s wondrous run in the lead. With Stage 8 came the weekend, the sun and finally fireworks of the racing kind. Readers who follow me on Twitter or Instgram will know that I was otherwise engaged on Saturday at London’s annual Tweed Run, meaning that I missed most of the best action of the race so far. Trek Factory Racing’s Julian Arredondo animated a large part of the day by getting into the early break and surviving as the numbers dwindled until he was still alone with less than 3km to go. On the first of the bigger mountain stages it was clear that attacks and gaps would define the day. Pierre Rolland sought to catch Arredondo first and, for a short time, seemed to have played the winning hand. But the gradients increased as the distance to the line fell and he too started pedalling squares and was overwhelmed by a chasing group a mere 100metres from the line. BMC’s Steve Morabito had brought Evans and the other main players up to the fading Frenchman but it was the Italians who had the last say on the stage. After a cheeky attack by Dani Moreno – no doubt trying to salvage some pride for Katusha after a truly miserable 24 hours, Lampre’s Diego Ullissi jumped again to steal the stage. Once more the peloton splintered in the final yards to give a couple of seconds here and there but, with Matthews still some 35 minutes down the mountain, the pink jersey was undeniably Evans’ to assume. Orica-Greenege were back to winning ways on Sunday though as Peter Weening successfully tracked down and caught Europcar’s Italian breakaway man Davide Malacarne to be able to contest a two up sprint. Domenico Pozzovivo and Ulissi made it second, thrd and fourth for the Italians with two super strong showings that Cadel could not match at the finish. Uran also finished strngly to make further ready progress and go into the second rest day in second place overall just under a minute down. Meantime the pre race favourite, Movistar’s Nairo Quintana, who had seemed either happy to follow or unable to attack all week was only placed 9th, albeit only 1’45’ down. The tightness at the top of the GC leader board was apparent with only 2 minutes separating the top ten. With still two weeks and all the proper mountain stages still to come the stage is set for a ding-dong battle between Evans – who has never had to defend a Grand Tour lead before – and the likes of Uran, Quintana and Kiserlovski, who have never won one before. One thing is certain: we are heading into new territory, and with the Gavia, Stelvio and Zoncolan still to exact their own reckoning on the riders we are a long, long way from Trieste. This entry was posted in Giro dItalia, Pro cycling and tagged cadel, Cycling, Giro, giro d'Italia, GREENEDGE, italy, kittel, MATTHEWS, ORICA, procycling, quintana, viviani. Bookmark the permalink.